The funeral of former Northern Ireland international footballer Derek Dougan has taken place in Wolverhampton. The former Wolverhampton Wanderers striker died last month, aged 69. Nicknamed 'The Doog', he won 43 NI caps. Many of his former international and club team-mates were at the church. 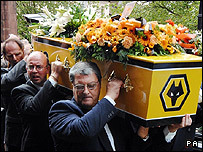 The Rev David Frith told mourners and the many Wolves fans gathered outside that Dougan was "an unsung hero of peace and reconciliation". "Not only did Derek have ideas about people from different backgrounds living in harmony, he also took action to bring it about. "The story of his off-the-field work to put together an all-Ireland football team ought not to be lost among the tales of his on-the-field prowess." The rector of Wolverhampton told mourners that Dougan was hugely proud of his Belfast roots, but was also deeply pained by the hatreds and tragedies of his homeland. Abide With Me, You'll Never Walk Alone and Danny Boy were sung by mourners, and the service was relayed on speakers for fans outside. Former Scottish international Denis Law said outside the church that Dougan was a "wonderful guy" and a "tremendous international player". Law said: "(He had a) tremendous combination with George Best at that particular time when Northern Ireland had a very, very good team." 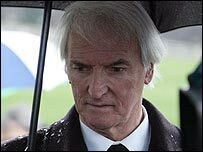 Dougan was a friend of Best and helped carry the coffin at the former Manchester United star's funeral in December 2005. The east Belfast man was an advocate for an all-Ireland football team and an outspoken chairman of the Professional Footballers' Association. Dougan scored more than 120 goals for Wolves and was in their victorious 1974 League Cup side. He also played for Portsmouth, Blackburn Rovers, Aston Villa, Peterborough United and Leicester City.